Even if you don t go to the city to minister, make no mistake the city is coming to you. Regardless of your particular cultural or geographical context, you will need to consider the city when forming a theological vision that engages the people you are trying to reach. In Loving the City, bestselling author and pastor Timothy Keller looks at the biblical foundations for contextualizing the gospel as we communicate to the culture in a way that is both respectful and challenging. 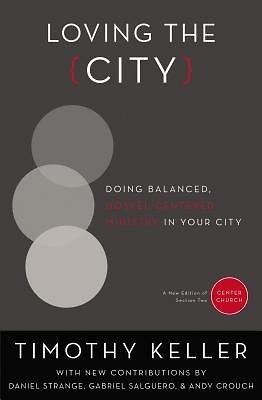 He articulates the key characteristics of a city vision, showing how the city develops as a theme throughout Scripture, from its anti-God origins, to its strategic importance for mission, to its culmination and redemption in glory. Finally, he examines the need for thoughtful cultural engagement, unpacking four models for engaging culture, showing the strengths and weaknesses of each approach and emphasizing a blended approach that balances the key insights of each. Loving the City will help you to minister to your cultural context in a way that is biblically faithful and fruitful. This new edition contains the second section of Center Church in an easy-to-read format with new reflections and additional essays from Timothy Keller and several other contributors.